On the meantime, I am testing different Sync solutions, and today I successfully tested one that could be useful for more than one person, that’s why I am sharing it on this post. As you might have heard the guys at BitTorrent are testing a product they called Sync, and what it does is precisely that, synchronization of files between your computer and devices and any other computer or device on any part of the world that you would like to sync with. BitTorrent Sync is still under development and it looks basic but its powerful, you select a folder to share, and you generate a unique key for that folder. Then you send that key to the person you want to receive the syncing of your files and thats all. After the recipient selected the destination drive where to place this synced folder, nothing else needs to be done, the automated both ways syncing will start. Of course the recipient has to have the Sync tool installed too :). You can also define read only access so that way the other person wont be able to add things to your folder, and even you have a temporary 24 hours access key you could send. So how all this works with BitCasa? Well, you can share stuff you have on BitCasa with Syncing functionality to others through BitTorrent Sync. 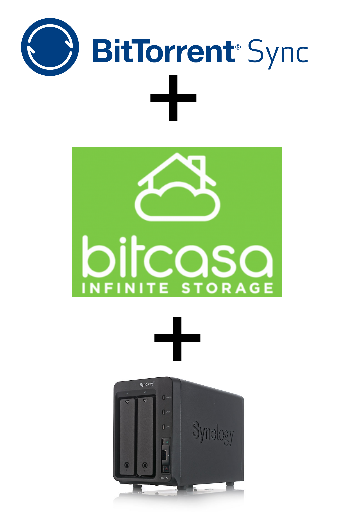 You can also sync folders of your family to a BitTtorrent Sync folder that you can place inside your BitCasa drive and they will be able to save their files on your BitCasa account, getting offsite backups of their files. Also, I´ve been reading (although haven’t tested it yet), that BitTorrent Sync has a package for different NAS devices for example Synology, and you could sync these files directly from the NAS to your BitCasa drive (through your computer). At least this will work until the guys at BitCasa prepare a package for the most devices like Synology, QNAP, Buffalo, iOmega. “BitTorrent Sync was designed with privacy and security in mind. All the traffic between devices is encrypted with AES cypher and a 256-bit key created on the base of the secret—a random string (20 bytes or more) that is unique for every folder.” You can read more about it here. So there are workaround´s for the specs BitCasa is missing, I really hope they move forward on the speed of their development, it could become a great product. Have you tried any of this? Do you have any other suggestion on how to sync folders using also BitCasa? I heard some people using GoodSync but havent tested it yet. I am syncing my files using Synkron on the mac. This works great. Better would be to have an app on the synology so no computer is required to sync. Have you tried this? What error are you getting? 1. Added a Sync folder – some folder inside drive C.
3. Added another Sync folder whith that same secret, inside my Bitcasa drive. Did I do anything wrong? Is there a different way to do it right??? I am not sure Bittorrent Sync can work to Sync internally as it is meant for remote syncing. If you need to add Sync functionality give a try to Good Sync, I read good comments and to be compatible with BitCasa. Can you explain precisely the procedure how to set this ?